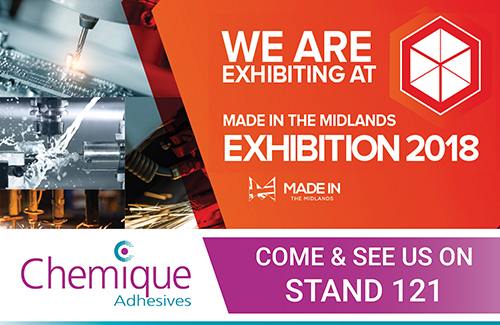 Visitors will be able to see the latest developments in adhesive technology and discuss their own requirements with the Chemique Adhesives’ experts on Stand 121 at the Ricoh Arena, Coventry on 21 June 2018. Chemique Adhesives will also be promoting its Total Service Package, which builds on the company’s commitment of providing outstanding service for tailor-made adhesive and sealant products as well as full engineering, technical support and training. The Total Service Package ensures that customers get the right adhesive and equipment for their specific application, as well as being provided with the guidance and knowledge to utilise this in the most efficient and cost-effective way possible.